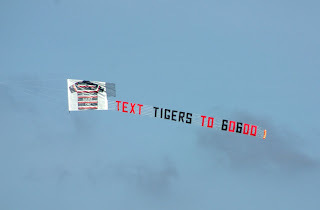 Over at Leicester today flying a promotional banner for the "Tigers" rugby team. Leicester is only 138 miles from Thanet as 'The crow flies' but I'm sure it seem rather longer by road. From the air and on a lovely autumn day like today, it looks like a very attractive city with lots of green spaces and a very accomodating airfield to operate from too! With the evening now starting to draw in, the banner season will soon come to end or at least quieten down until April of next year. It still runs through the winter but becomes increasingly more of a probability exercise, each time I fly as the winter weather depressions and shorter days make flying more challenging.